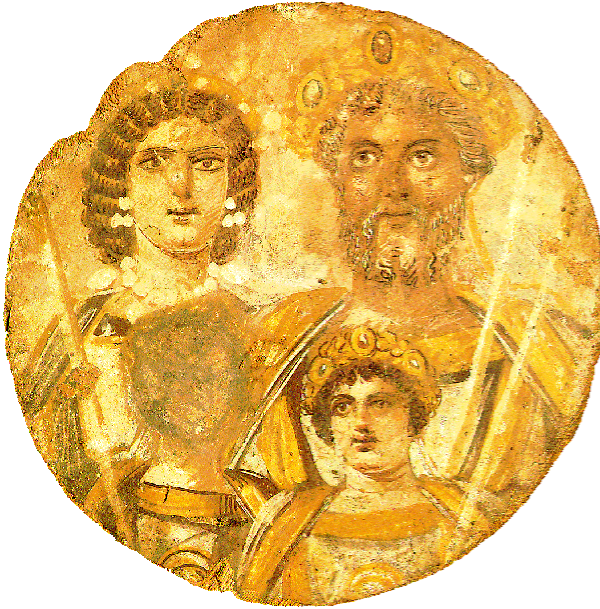 The Severan dynasty was a Roman imperial dynasty, which ruled the Roman Empire between 193 and 235. The dynasty was founded by the Roman general Septimius Severus, who rose to power as the victor of the 193-197 civil war. Although largely a peaceful time, the Severan Period was plagued by constant political turmoil and warfare - foreshadowing the imminent total collapse which followed the murder of Alexander Severus in 235 AD, and which we know as the Crisis of the 3rd Century. One of the characteristic phenomena of this period of Roman history was the very active role played by the empresses and other female family members. This is also reflected in an abundance of coins struck in their name. Reverse: VICTOR ANTONINI AVG, Victory walking right, holding wreath and palm branch. Obverse: P SEPT GETA CAES PONT. Bare-headed, draped and cuirassed bust right. Reverse: SECVRIT IMPERII. Securitas seated left, holding globe, left arm on chair. Obverse: L SEPTIMIVS GETA CAES, bareheaded draped bust right. Ref: RIC 2; Sear 7174; C 44. (60) Septimius Severus 193 A.D.
(65) Septimius Severus 195-196 A.D. Reverse: PM TRP III COS II PP, S-C, Jupiter standing left, holding Victory and sceptre, eagle at foot left. (84) Severus Alexander 222-228 A.D. Reverse: P M TR P COS P P - Mars standing left, holding olive branch and spear. Obverse: IMP ALEXANDER PIVS AVG, laureate, draped, and cuirassed bust right. Reverse: MARS V-LTOR, S-C across field, Mars advancing right, holding spear and shield.